In Ancient Africa music was designed for everyone to participate. Instruments were made from available items and there was always a simple rhythm the entire group could do. 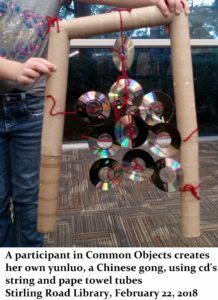 Common Objects pairs music, art, culture, and environmental responsibility. This program takes participants through the process of building an instrument, learning to play it and performing it all in less than one hour. In each cultural program participants will also learn about those places and their music. Choose one of the following programs, combine them together, or let us create one for you. The music of Japan, India, and Mexico that share a similar instrument, the pellet drum. Participants will also make maracas and finger cymbals. Tour Japan with the den den daiko and taiko drums. Use the drums to make Japanese flags and have an origami frog jumping contest. It’s nothing short of a fiesta with maracas, trumpets and guitars… all using a paper tube! Perform the Mexican Hat Dance take a whack at the homemade piñata. This trip to Europe includes a little flamenco dancing with penny castanets, a polka performance with tiny tubas, and waltzing with shoebox zithers. Join a safari to find the musical instruments of ancient Africa along with music by African American composers. A pipe cleaner and jingle bells become an Egyptian riq and sistrum, and a Nigerian ekpiri. See the similarities and differences in music from Spanish speaking nations. Play metal lid castanets in Spain, Mexican maracas, and Cuban salsa with a carboard box cajon. Learn about female composers and ancient cultures where women played a large role. Begin in ancient Greece with a lyre, head to Egypt for a sistrum, and on to Persia with finger cymbals.